HARARE City’s new gaffer Mark Harrison believes CAPS United will be under pressure when they clash at National Sports Stadium on Sunday. Harrison, whose first job in Zimbabwe was at CAPS United, says they will play their normal game as they start to fully utilise the club’s second chance in the Premiership. “It’s quite ironic that my first game back in Zimbabwe as a coach is against CAPS United so am looking forward to it. “We absolutely have no pressure at the end of the day, two weeks ago we were a first division team now we are back in the premier league,” said Harrison. “We are about to readjust to that idea and we are working towards kick off on Sunday but there is no real pressure on us. “The pressure is on CAPS United who are expected to win the game since they have a lot of experience in their squad. The City coach said there are no hard feelings. “There is nothing called revenge in football because if you carry that around with you then that becomes a problem. “It can affect your judgement and the way you operate so I don’t carry that around with me. “There were no big issues between me and CAPS United apart from the one we had with finances. Harrison is confident with his squad. 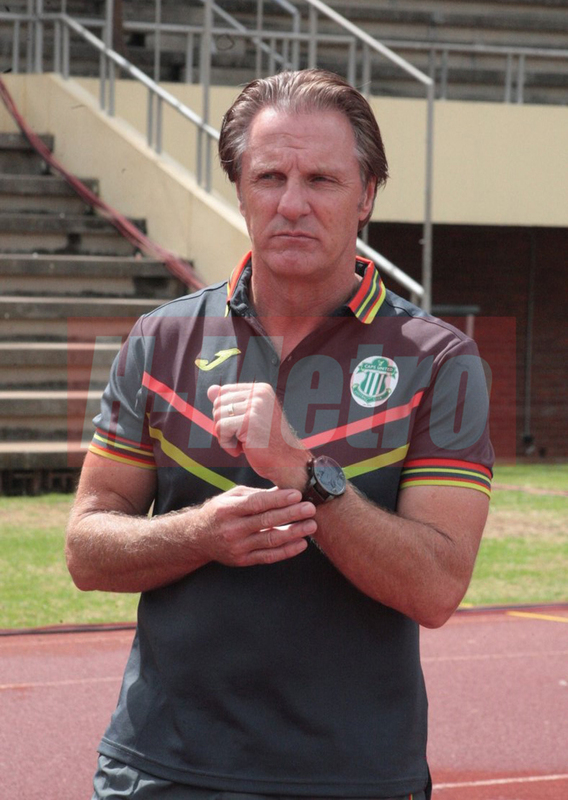 “Last year wasn’t the best season for Harare City with the team being relegated. “Considering the quality of players we had in our squad, being relegated was a big disappointment. “Now that we were given a second chance in the premier league we will try and consolidate. I think really our ambition is to make sure we are not in the same problem that we had last year. “I am very satisfied with the squad, the executive tried their best to support me in recruitment. “We have introduced five or so youngsters from our cubs which is what our team does with the developmental programme,” he said. Harare City’s new signing teenage midfielder Calum English-Brown has promised a better performance from Harare City this season. “Of late I wasn’t sure of what I wanted to do in terms of my football career, so when I got the offer from Harare City, I couldn’t let it pass. “I feel honoured to be chosen, not everyone at my age can get an opportunity to play in the PSL. This is a very big step towards the growth of my career, so I will definitely use this opportunity to my advantage. “I look forward to be part of the 2018 PSL history and I hope I will be getting enough game time. “I am confident Harare City will do better,” he said. Calum is also focusing on his school. “I will be attending my classes and I will be training as well. I do have a schedule that will allow me to balance both my football career and my studies. “I want to make my fans happy, develop my career and do well in my school work so I will work hard in everything. “I know this will demand my commitment and hard work and I am willing to do this,” he added. The young talented midfielder has played for the national under 17s. “It has always been an honour to represent my country. I don’t want to picture myself playing for another country,” he said.